WFN readers will likely remember the name Jaye Macumber. Jaye was formerly coach of AFL Canada club the Central Blues and in 2011 coached the Canadian national team, the Northwind at IC11. Jaye is now coach at Minyip-Murtoa in the Wimmera League in country Victoria (Australia). Well known footy journalist Paul Daffey interviewed Jaye this week for his The County Footy Show on his site PD Footy The original posting on the site is here The Country Footy Show Epidsode 15. Jason Johannisen was interviewed today after the Melbourne launch of the Multicultural Round. Jason told us of his Multicultural Ambassador role, that goal to win the game on the weekend, responds to questions about Lin Jong being seen at Collingwood and about spending time in South Africa. You can hear the audio below. 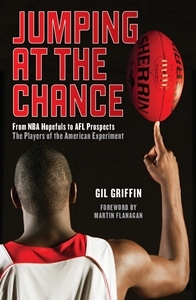 I sat down for a coffee and a chat with Gil Griffin author of Jumping at the chance this week on his promotional tour of Melbourne. You can hear the audio in the two parts below. If you read reviews you will often see a review that stands out from the others. It probably goes against the trend of the other reviews. And that is because it often comes down to personal bias held by the reviewer which will not be swayed regardless of the quality of the content. It should be stated up front of course. The AFL Record for Round 11 features an animated Mason Cox on the cover (see below) and a featured two page spread inside discussing his journey and impact so far. Below the ominous figure of Cox on the cover are the words "Be Warned! There are more of us on the way". You can watch the latest episode of "On the Record" here where Mason Cox is discussed and compared with the NRL's Jarryd Hayne who attempted to cross over to the NFL. Justin Trudeau's favourite Aussie expat Myk Aussie joined host Gabriel Morency this week on the Fantasy Sports cable TV Network. Myk previews AFL Round 9 and gives his best bets and picks for Round 9. He also gives the Canadian Nationals a plug and expects big things from the East team (currently 2-0 after Day 1). If you are in North America look out for Myk on your TV or on UStream with Gabriel on Friday nights. 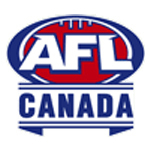 AFL Canada's first National Championships kick off today in Burnaby at the Burnaby Lake Sports Complex West (3677 Kensington Avenue, Burnaby, British Columbia V5B 4Z6). 24 players on the roster per match. The match will run for two (2) 20 minute halves with no time on. Umpires will award a fifty (50) metre penalty. 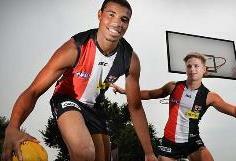 St Kilda today upgraded International Rookie Jason Holmes to the senior list and he was tonight named in their 25-man squad to play Essendon on Sunday. The American has been biding his time playing at Sandringham in the VFL this season after debuting in Round 21 in 2015 for the Saints and played in the last three matches of the season at AFL level. This season he has played for the Saints in the pre-season NAB Challenge but has since gained further experience playing as a key forward as well as in the ruck in five matches for Sandringham. Last week he had 8 disposals and 23 hit-outs for the Zebras against Casey Scorpions as his team went down by 31 points. He has kicked two goals this season, one each against Box Hill and Richmond. Against Footscray in Round 2 he probably played the best match of the year so far with 38 hit-outs and 6 tackles. 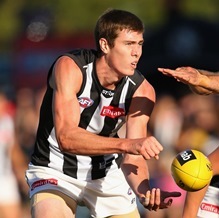 Fellow American Mason Cox was named at full forward for Collingwood after he seemed to have overcome having his hand stomped on during the match against Brisbane last weekend. If Holmes does play on Sunday (and Mason Cox plays as selected at Collingwood) it will be the first time two players from the USA have played in the same AFL round. On the Sunday footy show, Game Day, North Melbourne’s star ruckman, Todd Goldstein, was asked about the difference it makes playing against the bigger and more mobile ruckmen in the AFL. Apart from pointing out players like Max Gawn (Melbourne) and Aaron Sandilands (Fremantle) as examples of taller, influential ruckman he also responded to the impact of players like Mason Cox (Collingwood) and Jason Holmes (St Kilda) by suggesting there might be more on their way. In fact, Goldstein suggested that with the successes and developments of the American players coming to the AFL, he hopes they give him five or six years so he can retire and not have to face the onslaught.